"A twist on potato salad. 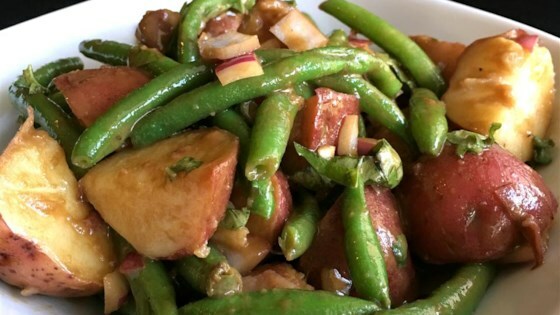 Green beans and potatoes are served in a Dijon mustard and balsamic vinaigrette." Place the potatoes in a large pot, and fill with about 1 inch of water. Bring to a boil, and cook for about 15 minutes, or until potatoes are tender. Throw in the green beans to steam after the first 10 minutes. Drain, cool, and cut potatoes into quarters. Transfer to a large bowl, and toss with fresh basil, red onion, salt and pepper. Set aside. In a medium bowl, whisk together the balsamic vinegar, mustard, lemon juice, garlic, Worcestershire sauce and olive oil. Pour over the salad, and stir to coat. Taste and season with additional salt and pepper if needed. Not too good. Too much vinegar. Kids didn't like the flavor, it was ok with me. Excellent change to the traditional potato salad - My culinary students and I added 3/4 cup of Miracle Whip to fill the missing flavor gap. Everyone really liked this recipe.